"a throwback to the days of Dashiell Hammett and Mickey Spillane...Those guys knew how to mix character development and action together and so does V. H. Folland." 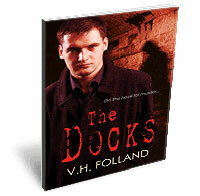 "The Docks" the well-reviewed crime novella by VH Folland, is coming out in paperback in November 2011. A slim mass-market paperback, it is on shelves at �4.99. It is now available from Waterstones. If you can't find it on the shelves, you can order it online or instore.